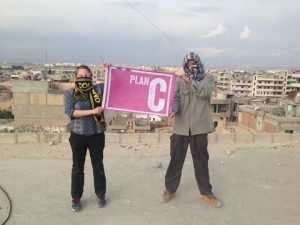 Two members of Plan C (UK) who have returned from volunteering in civil society in Rojava will discuss their experiences and how they think the revolution is transmitting in the area. The revolution in Rojava continues to develop geographically and deepen socially. The fact that a revolution based on political autonomy and women’s rights is flourishing at this time and in this region is a source of inspiration for many people across the world. But how is the revolution actually spreading and beyond the frontlines what does life look like in the Democratic Federation of Northern Syria? Two members of Plan C (UK) who have returned from volunteering in civil society in Rojava will discuss their experiences and how they think the revolution is transmitting in the area. Peter Loo and Sarah Patton spent 9 and 6 months respectively working in Qamishlo in Rojava in the civil structures of the revolution. They went as part of Plan C's Rojava solidarity cluster. Plan C is a UK based anti-capitalist organisation formed in 2011.